Videos: How Are State Budget Cuts Affecting You? Today the Southeastern Pennsylvania Budget Coalition and PathWays PA held an event to bring together members of the community to talk about how the budget cuts are impact their lives. Below are videos from the speakers and audience members who shared their story. Marianne Bellesorte of PathWays PA leads off the discussion at the PathWays PA and Southeastern PA Budget Coalition event. Then Esther Smits, a Consumer Volunteer from the Freedom Valley Disability Center, talks about how budget cuts have impacted her life. Kate Scully form PathWays PA talks about how budget cuts are impacting PathWays PA's clients. Gerry Gonzalez of Child Guidance Resource Center shares how budget cuts impact their services and clients. PathWays PA is in need of a Math and English teacher to teach Healthcare Contextualized Math, English and Science to adult students preparing for the TEAS test and other careers in the healthcare sector. Classes will be held late afternoons and/or evenings and weekends in the Bucks, Delaware and Montgomery County areas. The classes will run for 6-8 weeks with 1, 2 or 3 classes per week. 6-8 hours per week and 1 hour of paid prep per week. Pay is competitive. INSTRUCTOR SHOULD HAVE EXPERIENCE WORKING WITH ADULTS. A Bachelor's degree is a minimum requirement. Please fax resumes to: LD/EVE at 610-328-2807. PathWays PA was pleased to participate in yesterday’s Pennsylvania Conference for Women. The Conference is an opportunity for women through out the state to come together for information, advice, and support. 10. Treat yourself as well as you treat others. 9. Fear is a sign of growth. 8. Anger can be precious. 7. Use your own unique talents. 6. Measure yourself by the real not the ideal. 5. Look for allies everywhere – do not be bound by conventional hierarchies. 4. There are great advantages to feminine human qualities – use them. 3. Just about everybody can learn to change, even us, even them. 2. Ask for help and surround yourself with people who make you feel smart, not dumb. 1. Remember your humanity, equality and self determination is the key to everything. "Daily Times to be honored as PathWays' Trailblazer"
"PathWays PA will celebrate its 33rd anniversary and honor their 2011 Trailblazers - including the Delaware County Daily Times - at a special dinner on Nov. 1. The gala will help PathWays commemorate over three decades of helping low-income women, children and families in the Greater Philadelphia region achieve self-sufficiency. 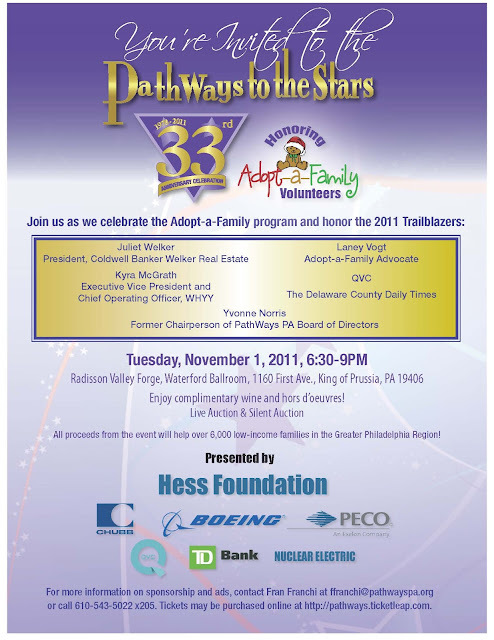 To help mark the PathWays to the Stars 33rd Anniversary Celebration, PathWays PA will be honoring six local community leaders and organizations with the 2011 Trailblazer Award. The event, which will take place at the Radisson Hotel in King of Prussia from 6:30-9PM, is a time to celebrate the work of PathWays PA, but also a time to recognize those in our community who make a difference." To read the whole article, please visit The Delaware County Daily Times website. Bid Online for Great Auction Items to Support PathWays PA! The online bidding for auction items is now open. Our auction link, http://www.pathwayspa.org/auction_items.html, will take you to a world of shopping and fun, while providing support to 6,000 women, children and families! The Agriculture Appropriations bill is currently on the Senate floor, and Senator Jeff Sessions (R-Ala.) has introduced an amendment (810) that would eliminate categorical eligibility for SNAP. Such a cut would take 1 million needy people from more than 40 states out of the SNAP program, take free school breakfast and lunch away from 200,000 low-income children, increase hunger among children and seniors alike, and vastly increase state administrative costs and red tape. The vote on this amendment can happen as early as tonight. With one in six households struggling against hunger, this is not the time to make drastic cuts and add unnecessary red tape in valuable nutrition programs. Contact your Senators immediately and urge them to oppose any attempt to harm SNAP. This past summer, the Pennsylvania legislature passed an Industry Partnerships bill that permanently established the Industry Partnerships program as part of the state's workforce development strategy. While Industry Partnership advocates and our legislative champions were dismayed by the lack of funding that Industry Partnerships received in the 2011-12 Pennsylvania budget, we are happy to report that efforts to find additional funds for Industry Partnerships are ramping up. A new House bill sponsored by Thomas Murt and Eugene DiGirolamo would designate 2% of the funds from a proposed natural gas drilling fee to Industry Partnerships—an estimated $2.7 million in this fiscal year and $11.2 million by 2017. From our friends at the Coalition for Human Needs. The Senate will vote on the Teachers and First Responders Back to Work Act within the next 24 hours. Call 1-888-245-0215 NOW to tell your Senators to support the bill! The Teachers and First Responders Back to Work Act (S. 1723) will save or create nearly 400,000 education jobs through critical investments in the education of our nation’s children. With the majority of states facing budget shortfalls in 2012 totaling more than $100 billion, cuts to state and local spending on education place thousands of teaching jobs at risk. This act will provide states with an additional $30 billion in funds that will support nearly 400,000 education jobs, in addition to $5 billion to keep thousands of police officers and firefighters working. The $35 billion cost of the bill will be paid for by asking millionaires to pay their fair share with a surcharge of less than 1 percent on income over $1 million. Yesterday, the National Human Trafficking Resource Center Hotline Act (SB 338) was unanimously voted out of the Senate Labor & Industry Committee! 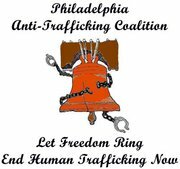 This state legislation would require posting of the National Human Trafficking Hotline - 1-888-3737-888 - so trafficking victims can call to get help or individuals can call if they see anything suspicious. The Hotline is a run by a national organization called the Polaris Project. They answer calls 24 hours a day and 7 days a week. Calls can be kept confidential or if a response is needed the Polaris Project will link the caller with local police and/or a social services agency. The legislation requires posting of the hotline number at locations where trafficking victims might see it including: hotels, motel, bars, restaurants, and bus stops. It could be a lifeline for someone being trafficked or a way for someone to take action when they see something they believe is trafficking occurring. Passage of the Child and Family Services Improvement and Innovation Act means that states will be better able to invest in initiatives that help improve child safety and family stability as well as move children from foster care into safe permanent homes. The law reauthorizes two important child welfare programs and incorporates improvements to ensure that children can safely remain with their own parents or be supported by other caring adults. The law renews child welfare waiver authority to allow more states to invest in new ways of serving children at risk of abuse and neglect. In addition, the law establishes a process to create child welfare data standards that can help drive further improvement to foster care systems. How Are State Budget Cuts Affecting You? The cuts to the state budget this year have already had a devastating effect on our families, our services, our county, and our state. Now is the time to tell legislators what we need to succeed in future budgets. 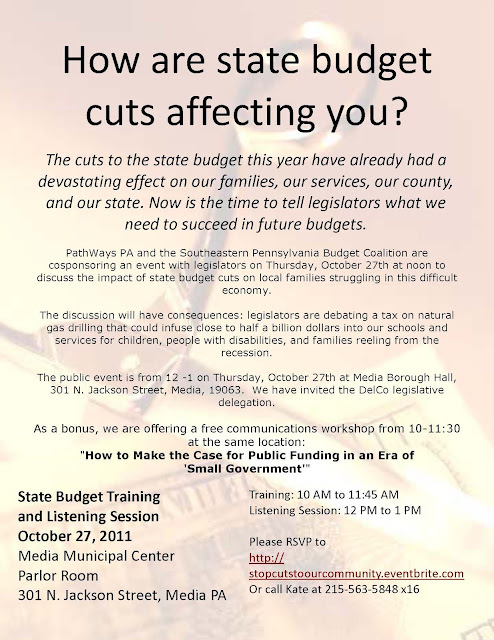 PathWays PA and the Southeastern Pennsylvania Budget Coalition are cosponsoring an event with legislators on Thursday, October 27th at noon to discuss the impact of state budget cuts on local families struggling in this difficult economy. The discussion will have consequences: legislators are debating a tax on natural gas drilling that could infuse close to half a billion dollars into our schools and services for children, people with disabilities, and families reeling from the recession. The public event is from 12 -1 on Thursday, October 27th at Media Borough Hall, 301 N. Jackson Street, Media, 19063. We have invited the DelCo legislative delegation. JOIN US IN CELEBRATING 33 YEARS OF PATHWAYS PA! Enjoy complimentary wine and hors d'oeuvres as well as a live and silent auction. All proceeds from the event will help over 6,000 low-income families in the Greater Philadelphia Region! Please consider sponsoring the event or purchasing an ad in our program - click here for more details. The State Legislature was in district recess last week due to Columbus Day Holiday, but controlling hospital infections, a topic they have consistently focused on garnered some attention. According to an article in the Pittsburgh Tribune Review, reported cases of two common and potentially deadly types of hospital-acquired infections dropped significantly last year at Pennsylvania hospitals, the state Department of Health reported on Wednesday. Bloodstream infections caused by central lines — catheters typically used in intensive care units to deliver antibiotics and fluids into the bloodstream — declined 24.4 percent from 2009 to 1,606 cases last year. Catheter-associated urinary tract infections declined to 3,245 cases, a decrease of 13.2 percent from two years ago. The overall rate of hospital-acquired infections dropped by 3.4 percent last year against 2009 rates. Click here to read the Pittsburgh Tribune Review article. The National Women's Law Center recently released its 8th annual state-by-state review of child care assistance policies. The report, State Child Care Assistance Policies 2011: Reduced Support for Families in Challenging Times, discusses the influence of five factors that determine accessibility, affordability, and quality of assistance in each state and the District of Columbia. These factors include waiting lists for assistance, income eligibility, reimbursement rates for child care providers, eligibility for parents searching for a job, and copayments required from parents. As a result of the debt ceiling deal in August, Congress agreed to $1 trillion in cuts to federal spending. Now, a Congressional "Super Committee" is working to find ways to reduce the deficit by an additional $1.5 billion dollars and must submit their recommendations by November 23rd. The Super Committee is meeting right now to decide what its recommendations will be. It is critically important for our nation's families to weigh in! Send a letter to your members of Congress telling them that it's unacceptable to balance the budget on the backs of children and families on Main Street. The decisions that are being made right now will define the direction of our country for years to come. Deficit solutions must create jobs and protect vital programs for children and families. Juliet Welker-President, Coldwell Banker Welker Real EstateKyra McGrath-Executive Vice President and Chief Operating Officer, WHYYLaney Vogt, Adopt-A-Family AdvocateQVCThe Delaware County Daily TimesYvonne Norris-Former Chairperson, PathWays PA Board of Directors Enjoy complimentary wine and hors d'oeuvres as well as a live and silent auction. Please consider purchasing a sponsorship in the event - click here for more details. Will Deficit Reduction Mean More Moms Going Without Food? On October 4th and 5th, people across the country will be calling their Senators to make sure that deficit reduction doesn’t mean more people going hungry. The “super committee” is currently debating a deal to reduce the deficit. Some proposals could cut essential programs that families need to get by; programs like Medicaid, SNAP (food stamps), housing assistance and other important services. We need a plan that puts us on the right track by investing in jobs, protecting low-income people, sharing the burden by asking top-income households and profitable corporations to contribute more revenues, and seeking savings from reducing waste in the military and elsewhere. Please, raise your voice and contact your senators, on behalf of parents everywhere who are struggling to put food on the table. Call toll-free at 888-907-1485. How Much Does Employee Turnover Really Cost Your Business? From our friends at CLASP/CEPR. Did you know that experts estimate replacing a salaried employee costs 150 percent of compensation? Or that replacing an $8/hour worker costs an average of $5500 per person? If you own a business, now might be a good time to see how much turnover is costing you. Despite the harm it can cause to the bottom line, many businesses do not actually know how much turnover costs them. Policies that support workers, such as paid sick days, can help decrease turnover and reduce these costs. This turnover calculator provides an estimate of how much turnover costs your organization. 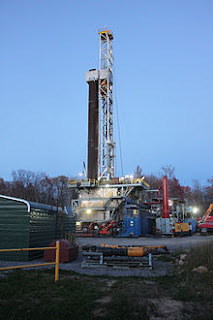 Earlier today Governor Corbett announced details of his plan for addressing the costs and environmental impact of the natural gas drill in the Marcellus Shale. The governor’s proposal calls for a fee to be placed on each well and establishes environmental standards and enforcement. Counties would be permitted to set an impact fee of no more than $40,000 per well in a well's first year. The plan estimates these fees would generate $120 million in the first full year, and $195 million by the sixth year. Most of the money would remain in drilling communities, while 25 percent would go to the state for environmental protection, health, emergency management, and pipeline inspection. In addition to the Governor’s proposal, State Representatives Thomas Murt and Gene DiGirolamo also plan to introduce a natural gas drilling tax bill. The Department of Labor is currently in the consideration stages of a tool that would help monitor pay fairness. Though laws like the Lilly Ledbetter Fair Pay Act of 2009 helped make it easier to file gender-discriminated unfair pay claims, to date there is no federal tool that effectively monitors wage discrimination on the basis of gender, race or national origin by private employers. The National Women’s Law Center is urging people to support the tool, especially as it relates to private employers taking public dollars. For more information, please visit the NWLC’s site. The House returned to session one week after the Senate and the legislature is taking up many issues this fall. With that in mind, the House and Senate Transportation Committees held their second public hearing on the Governor’s Transportation Funding Advisory Commission’s report. Lawmakers heard testimony from the PA State Association of Township Supervisors, the Keystone State Railroad Association, the PA Public Transportation Association, and the Commonwealth Foundation regarding the report’s recommendations. For more information, please click here.